From Hartsfield-Jackson Atlanta International Airport: Merge onto I-85 N toward Atlanta. Keep left to take I-85N / GA-403 N via Exit 251. Merge onto GA-400 N (50¢ toll) via Exit 87. Continue onto GA-400 N﻿. Take exit 7a toward Norcross (Holcomb Bridge Road). The exit automatically veers to the right. Make a right at the 2nd light (Old Alabama). Take the 3rd entrance on the left. 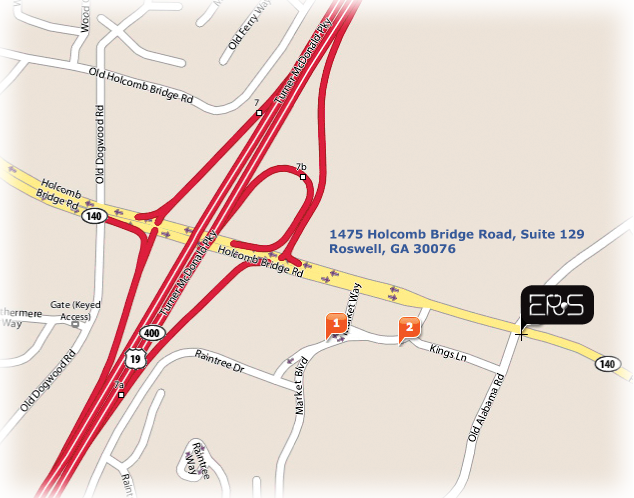 Traveling 400 N: Take exit 7a toward Norcross (Holcomb Bridge Road). The exit automatically veers to the right. Make a right at the 2nd light (Old Alabama). Take the 3rd entrance on the left. Traveling 400 S: Take exit 7 and make a left (Holcomb Bridge Road). Go to the 3rd light and turn right (Old Alabama). Take the 3rd entrance on the left. Traveling Hwy 92: Hwy 92 is Holcomb Bridge Road. Follow Holcomb Bridge Road over GA 400, at the 3rd light make a right onto Old Alabama. Take the 3rd entrance on the left.